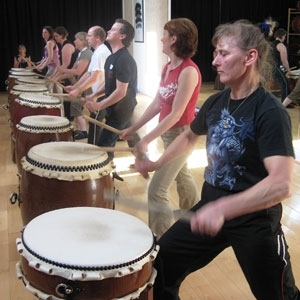 An 8-week taiko drum course in The Space in Glasgow, or St. John's in Edinburgh, or at the Mugen Taiko Dojo in South Lanarkshire. Please do contact us first to check if there are spaces before paying online. Course Fee for 8 week Taiko course. Mugen Taiko Dojo T-shirt - "Orange Drum"
Mugenkyo T-shirt - "20th Anniversary"